OSHA’s hearing conservation program is designed to protect workers with significant occupational noise exposures in various industry sectors from hearing impairment even if they are subject to such noise exposures over their entire working lifetimes. All employers are required to implement a Hearing Conservation Program (https://www.osha.gov/Publications/OSHA3074/osha3074.html) where workers are exposed to a time weighted average noise level of 85 dBA or higher over an 8 hour work shift. 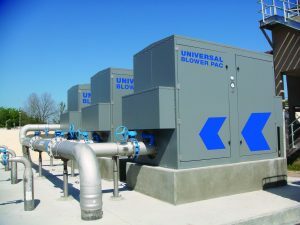 As a market leader in blower system engineering and manufacturing, INOHVA, in partnership with our sister company Universal Blower Pac, naturally understands this impact on plant managers and how best to control noise exposure for system operators. As a result, we have been providing state of the art sound enclosure solutions for a variety of blower systems and industrial equipment since 1979. We manufacture both standard, semi-standard, and custom enclosures to help meet OSHA requirements on any budget, whether we provided the original blower system to you or not. The ATTENU-PAC is a full sound enclosure solution and comes in a variety of sizes with various options. Choose from standard sizes or our engineers can make sizing adjustments to get an exact fit. UBP and INOHVA have mastered the ability to reach acceptable noise levels with the ACOUSTI-PAC partial enclosure. This achieves up to 60% noise reduction of the ATTENU-PAC for 30% of the cost. 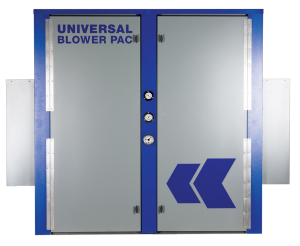 The enclosure is designed to compactly fit around the blower, the loudest noise source. 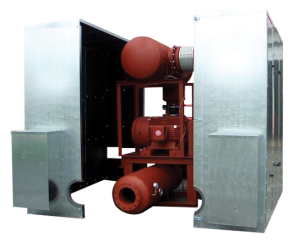 We then acoustically treat the discharge based upon frequency ranges to minimize the secondary noise sources. 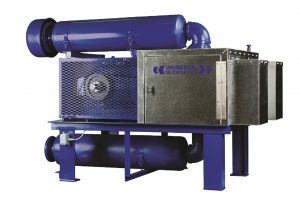 INOHVA Engineers are available for site visits to help advise on specialty sizing or installation issues and make recommendations on how best to achieve OSHA requirements for any equipment.